Tenkar's Tavern: Discord Thoughts - An OSR Online Con - Dare I Say? TenKon! Discord Thoughts - An OSR Online Con - Dare I Say? TenKon! Discord plus Roll20 or Fantasy Grounds 2 is a viable solution. - Would you play a game session in an Online OSR Convention? - Would you run a game session in an Online OSR Convention? - Would you attend a panel discussion in an Online OSR Convention? The cost to attend would be ZERO. 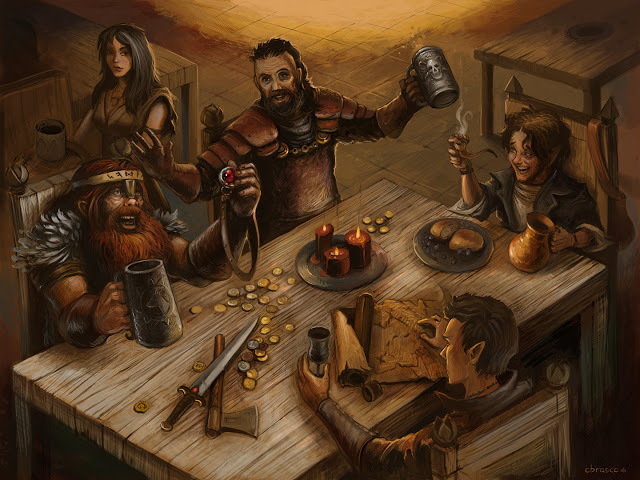 The Tavern would offer some random gifts to attendees with perhaps further gifts offered from publishers. Spread the word on this post, because if there is enough interest we'll get the ball running. Total side note - if you are a member of the Tenkar's Tavern Live Discord Server, drop into the swords - wizardry - light channel. The Swords & Wizardry Continual Light Beta Rules are linked there for your enjoyment. Not sure how long I'll leave them up there, so grab them soon. Work commences on laying out the SWCL rules via InDesign and with edits, corrections and clarifications this week and continues until completion. I'd attend, run games, listen to or serve on a panel (if it falls inside my subject matter)... you have my sword. I am very interested in this, both playing and running a game! So, how do we become a part of the discord server? Joining is free. Click on the Discord Box on the right side of this page to join. It has a very active text chat and we will be scheduling times for voice chats. Post the games to YouTube after too ok? I would attend, play and go to a virtual pannel. Not up to running presently, but at some point in the future, sure. I'd be up for all of the above, excepting running a game at this point. I have run a few games on Roll20, but none using the Swords & Wizardry Light rules. At the very least I'd attend some panels. Maybe I could offer a free PDF or something from my publications. Yes, I would also be interested in running an OSR game and/or doing a panel. Not a big fan of Roll20 (I use FG these days) so that might be difficult for me if you choose that medium. Sounds like a blast though. I'm figuring run games using both. Would make clear which VTT is being used in the game sign ups. With a skilled DM, FG2 is hard to beat. Sadly, as far as I know, FG2 is not OSX friendly and unless you have one of those unlimited licenses, your players need to purchase the software. FG works on a Mac in an emulator and many people run it that way. The licence requirements do exist but most DM's just get the ultimate license. I would be up for all of the events you're looking for. I'd just have to learn to use Rolld20. Yeah, this would be fun. I'd attend/run games and listen in on some panels. I would run a game using Castles and Crusades in Fantasy Grounds as long as the timing is right. No cost to anyone with my license. I would definitely join in for Roll20. Even though I much prefer face-to-face interaction, I could probably do something for an online RPG convention. And even if I wasn't part of it, I think it's a good idea to have something like that. However, I think you should call it something like Tenkar Con for the purposes of branding. Anyone Know Where Charlie Mason Is?